Photo: William B. Plowman/NBC/Getty Images. Earlier this week, some seriously depressing food news came out of Washington, D.C. Though we've come to expect only the most dreary of reports from our nation's capital these days, the fact that President Trump served fast food to the Clemson football team during the White House dinner celebrating their national championship title was still pretty disconcerting. Last night, however, Alexandria Ocasio-Cortez swooped in to lift our spirits — as she is wont to do — with an Instagram photo that proved not everyone is D.C. has questionable standards when it comes to snacks. Ocasio-Cortez — who recently became the youngest woman to serve in Congress in the history of our country — shared a photo on her Instagram story yesterday that showed her loading up on snacks at CVS. On the picture, AOC wrote, "I went to pay for my snacks (bc in DC I am hungry all the time) and the cashier asked me "Do you have the munchies," which she followed with the crying laughing emoji. Man, she's charming. We understand the cashier's curiosity about the congresswoman's state of mind when she picked out the snacks because her selections were, unsurprisingly, kickass. Ocasio-Cortez struck a balance by purchasing some items that would provide much-needed fuel to help her continue championing the Green New Deal and indulgence to bring her joy as she repeatedly shrugs off the haters. 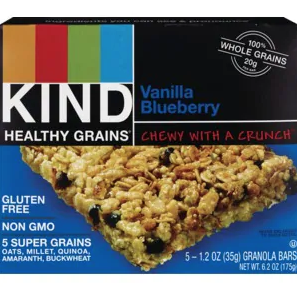 Piled in her arms as she approached the cashier at CVS last night was a box of Almond Butter Dark Chocolate Kind Bars, a box of Vanilla Blueberry Kind Bars, two unidentifiable blue bags (any guesses as to what those might be? 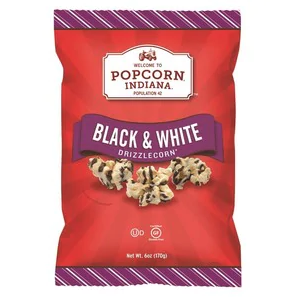 ), and finally a large bag of Popcorn, Indiana Black & White Drizzlecorn. AOC's late-night snacks of chocolate-covered popcorn and gluten-free granola bars proves two things that make us so happy. One, it's another reminder that she's sensible, fun, and oh-so-relatable. And, two, it shows that there are still some politicians we can trust, and not just to pick good snacks.